The luxuriously thick outer paper is 100% recycled, including 10% recycled cocoa shell. We're proud to display the FAIRTRADE Mark, and logos from the Soil Assocation and Vegan Society. All our packaging meets this criteria, except for the foil which is recyclable but not recycled — we have yet to find a suitable food-safe recycled foil! Colourful illustrations courtesy of Cambridgeshire artist Nancy Voak. 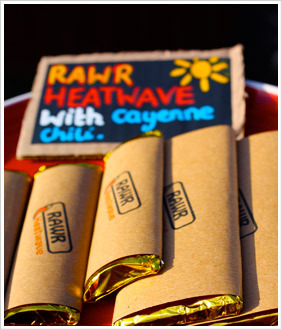 When Rawr was born, we needed an easy way to package our chocolates. At the same time, we wanted to package them in a way that was environmentally friendly, and yet unique and eye-catching. That's when we noticed the roll of parcel paper lying across the room. Aha! After much cutting, wrapping, and experimenting, it was decided. Rawr Chocolate would wear brown. Since then, we've added lots of colour, and swapped kraft paper for a material even more perfect for our chocolate — recycled cocoa shell paper.